Much has been said and written about the so-called “gig economy,” in which workers are not employees, but rather independent contractors. Some people like the freedom and flexibility it offers. Others prefer the security and predictability of full-time employment. Regardless, a new report from Staffing Industry Analysts (SIA) suggests contract work is on its way to becoming the new normal in employment. The report shows that employers spent $792 billion on contract workers last year. In fact, 29% of all U.S. workers performed some kind of “gig” work in 2015. For the purposes of the report, a gig is defined as any contingent work. It can include working as an independent contractor, consultant, or a freelancer. 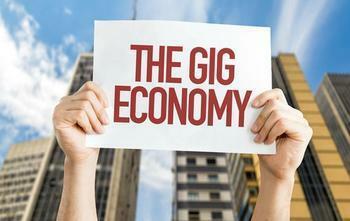 The term gig has recently become closely associated with freelance work made possible by the internet. For its purposes, SIA considers the term to describe work on a short-term basis. "At close to $800 billion, gig and contingent work is a very large sector of the economy, on par with areas that get much more scrutiny and understanding," said Barry Asin, President of SIA. "It's important to understand what is happening in the gig economy, not the least because there is a significant portion of the U.S. workforce that prefers alternative work arrangements to traditional, full time employment." Asin says nearly 40% of people in the survey prefer alternatives to a traditional job, claiming 69% of independent contractors and self-employed workers prefer that to a full-time job. At the same time, there are undoubtedly a lot of people in the gig economy who would prefer full-time jobs, but can't find them. After the financial crisis of 2008 rocketed the unemployment rate past 10%, businesses began to turn to the gig economy as they needed additional help. The U.S. Department of Labor says there is no clear accounting of gig economy workers, the SIA report not withstanding. It says the most recent data comes from 2005, well before the financial crisis. At that time, the government found that contingent workers accounted for 2% to 4% of all workers. The government notes that some occupations lend themselves more to the gig economy than others. For example, it says work that involves a single task, such as writing a business plan, lends itself well to this type of arrangement.